From the U.S. side, those who most directly helped jumpstart the special relationship were some of the best and brightest of America’s medical doctors, nurses, and teachers. They administered treatment to Arabia and the Gulf citizenries’ elites and rank and file at sites throughout southern Iraq and eastern Arabia – including in Bahrain, Kuwait, and Oman – under the auspices of the Arabian Mission of the Dutch Reformed Church of America. In the manner of their service, comportment, and demeanor, what stood out were these early Americans’ undaunted volunteerism. In addition, from the outset it was all too apparent that they were not colonialists. They were not even imperialists. Rather, they were sincere humane providers of badly needed health care and educational services. In keeping with their values, principled convictions, and humanitarian commitments, these Americans sent no invoices. They, not others, were the truly remarkable pioneers of the special Saudi Arabia-U.S. relationship that has ever since been the envy of virtually the entire rest of the world. In trying to understand the nature and extent of the roots of the U.S.-Saudi Arabian relationship, what one will far more often read about is not the story just told. Instead, one will more likely hear about a largely unchallenged allusion pertaining to the 1945 meeting. It is to an alleged pledge by the United States made then to thenceforth uphold, honor, and protect the Saudi Arabian government’s security from attack, threat, or intimidation. The pledge was reportedly in exchange for a promise by the Kingdom to provide unlimited exports of petroleum that would be needed to speed and ensure the recovery of the war-devastated economies of Europe. What has hardly been fair or helpful in understanding the Saudi Arabian oil exports-for-U.S. security narrative surrounding the 1945 meeting is what it implied. The substance of the narrative connotes an innate insecurity and weakness on the part of Saudi Arabia. This is contrasted with the unbridled power and strength of the United States, whose overriding interest then was not in Saudi Arabia as a country and people, per se, but, rather, in an inanimate object the country possessed: a finite and depleting substance called oil. Consider for a moment the subsequent analytical and long run American foreign policy implications of the 1945 meeting that for so long have been unquestioned. Zero in on what has ever since largely been unchallenged. The emphasis then and ever since has been on the position and role of the United States as a humanistic subject in the form of a mighty if not entirely altruistic defender. In contrast, the insinuation was of Saudi Arabia as an inanimate and inordinately weaker object in need of American protection. It takes little to imagine how such a portrayal of the two entities would serve some people’s interests. Indeed, for Saudi Arabia’s many opponents in the non-Arab Middle East, in the United States, and elsewhere, the narrative has been useful. It has helped feed the notion that the Kingdom should not be allowed to compete in the international arena on a level playing field fairly and equally with other countries and, least of all, with more favored American partners in the region in which it is situated. To that end, Riyadh’s detractors have been consistently intent on “killing the competition” that the Kingdom’s partnership with the U.S. represents. In that regard, reducing the imagery of the Kingdom in the popular imagination, the media, academe, and foreign policymaking circles to one that focuses only on the country’s hydrocarbon deposits feeds a largely negative and defaming narrative of the government and its peoples’ insignificance. The case can be made that America all along was capable of viewing the matter differently – and more fairly – and that this should have been obvious. Apparently, though, it wasn’t; either that or such efforts to that effect, if any were mounted, proved ineffective. It is easy to imagine why some parties have long sought to advance the negative narrative. Take, for example, Saudi Arabia’s sheer size. Compare it with the far less significant landmass of other countries in the region. Indeed, with its 13 land and maritime neighbors, the Kingdom can be likened more to a continent than a country. In this regard, few countries can come close to matching the degree to which those dependent upon freedom of aerial and maritime access and passage to and from the planet’s main East-West and West-East transportation routes have no choice but to obtain the Saudi Arabian government’s permission. Add to the equation Saudi Arabia’s innate power, prestige, and position among the world’s nearly two billion Muslims that are derived from its role as Custodian of Islam’s two holiest places, Makkah and Medina. Link that role to Makkah being the focal point of every Muslim’s prayers and, in addition, the Kingdom’s annual hosting and administering of the hajj, the ritualistic pilgrimage enjoined of every Muslim during their lifetime. Pilgrims surround the Kaaba at the Holy Mosque in Makkah, Saudi Arabia, in this 1910 picture. At the time of Saudi Arabia’s unification in 1932, the Holy Mosque could accommodate 48,000 worshipers. Today, after the Saudi Arabian government has completed ongoing projects to expand its capacity, it can accommodate around 1.8 million pilgrims. Photo: U.S. Library of Congress. No other country, in short, comes close to rivaling the Kingdom as the epicenter of prayer and pilgrimage, and of faith and spiritual devotion, for the nearly a quarter of humanity that adheres to the Muslim faith. Neither can any nation rival Saudi Arabia’s standing among the 57 Muslim-majority nations that are members of the Organization of Islamic Cooperation, Islam’s highest political body. With regard to its resources, few, if any, can match how Saudi Arabia has leveraged its range of geopolitical, economic, and other physical assets. These include, remarkably, nearly one-fifth of the world’s proven oil reserves (in comparison to America’s one-fiftieth); Saudi Arabia’s standing in sixth place among countries in terms of proven natural gas reserves; and Saudi Arabia’s having developed a petrochemical sector from non-existence a little more than a quarter of a century ago into it being one of the main pillars of its economy. These mineral-based features of the Kingdom, which are little known beyond specialists, are ones that impact the needs and longings of billions of human beings. This is not all. The aforementioned Saudi Arabian facets are in addition to the accompanying power and influence that derive from the Kingdom being a founding, longstanding, and often-leading member of numerous among the world’s most prominent and powerful international organizations, e.g., the United Nations, the International Court of Justice, the World Bank, the International Monetary Fund, the League of Arab States, the Organization of Islamic Cooperation, the Organization of Petroleum Exporting Countries, the Organization of Arab Petroleum Exporting Countries, the Gulf Cooperation Council, the Gulf Organization for Industrial Consultancy, the Gulf Investment Fund, and the Arab Monetary Fund. Heat map showing different countries’ crude oil proved reserves in 2016. Saudi Arabia’s reserves total 267 billion barrels, Russia’s reserves total 80 billion barrels, and U.S. reserves total 35 billion barrels. Data and image: U.S. Energy Information Administration. The foregoing should provide ample reason why it is important not to lose sight of all that Saudi Arabia has long represented and continues to represent, which is of immense interest and importance to humankind. Even so, it is easy to see why so much of the attention surrounding Crown Prince Mohammed bin Salman’s visit has focused and is likely to remain fixated on issues, challenges, and opportunities linked to the immediate present. Doing so, however, risks obscuring something else, which pertains to the Kingdom’s position and role in regional and global affairs. An awareness and appreciation of Saudi Arabia’s association with the abovementioned phenomena, and their bearing on other countries’ relationships with the Kingdom, is vitally important. This has to do with why it is and has been of such enormous significance throughout the entire century-long period dating from before the Crown Prince’s visit. It has to do, also, with why, not just to the United States but to the world in general, the Kingdom is certain to remain of extraordinary strategic, economic, political, commercial, and defense cooperation significance – and in roughly that order of priority – for far into the future. With this as background, context, and perspective, what the Crown Prince’s upcoming visit can be seen as is additional evidence of a renewed invigoration between Saudi Arabia and the United States, and one that has grown far beyond the foundation of the longstanding bilateral partnership. Not just to the United States but to the world in general, the Kingdom is certain to remain of extraordinary strategic, economic, political, commercial, and defense cooperation significance – and in roughly that order of priority – for far into the future. Viewed in this light, the visit of King Salman’s son and Saudi Arabia’s future leader seeks to further relations between the two countries in numerous fields. It serves to continue to build and deepen confidence between the two partners as they work to address national, bilateral, regional, and global challenges. Accordingly, investment and strong economic relations between the Kingdom and the United States are two cornerstones of the multi-dimensional relationship. What, then, do Crown Prince Mohammed bin Salman’s planned stops in multiple U.S. cities imply? They indicate that the leader of the Arab and Islamic world’s most important country is traveling to America in what might be considered a “road show” intended to build additional momentum for American investment in Saudi Arabia’s Vision 2030 national development plan. In some regards, the concept of a road show could also be seen as a metaphorical Saudi Arabian caravan traversing America with a view to promoting, explaining, and securing greater U.S. interest and investment in the economic and social transformations taking place in the Kingdom. Against any backdrop or frame of reference, the emerging era of Saudi Arabian-U.S. relations is therefore entering a significant juncture. A relevant window for perspective is, arguably, the one associated with the Crown Prince’s grandfather in the very early 1900s. That provided the cornerstone of all the subsequent efforts to establish the national confines of the current Saudi Arabian state. Viewed thusly, it is easy to see Crown Prince Mohammed Bin Salman positioning himself as a similarly revolutionary and transformative figure in Arabia. Indeed, half a decade ago, when he had just past the quarter of a century mark, a Saudi Arabian friend of mine said he had overheard Prince Mohammed Bin Salman saying to someone else, “Just wait. You haven’t seen anything yet.” This was years ahead of when he began to implement what he presaged and promised. Custodian of the Two Holy Mosques Saudi Arabian King Salman Bin Abdulaziz Al-Saud confers with HRH Prince Mohammed bin Salman during U.S. President Donald Trump’s May 2017 visit to Saudi Arabia. Photo: Saudi Press Agency. If the prediction as reported to me by my friend was correct, it is clear that the Crown Prince’s ideas and intentions were not born yesterday. As the Kingdom continues to endeavor to absorb its extraordinarily young and educated population into its workforce as effectively as possible, Muhammad bin Salman – himself one of that very half of the country’s population that is his age or younger – is working, in effect, to reimagine and reinvent Saudi Arabia. He is intent on doing this for the country’s relationship with itself, with the regional realm in which the Kingdom is situated, and with the global community beyond – all three at the same time. In this regard alone, the United States has an interest in seeing its Saudi Arabian partner succeed. That success might well be measured in prioritizing as well as in enhancing first and foremost the country’s security. Upon this will turn the prospects for Saudi Arabia’s stability. Upon these two phenomena will ride the Kingdom’s prospects for peace. And upon all three will be tethered the country’s longer-run ambitions and possibilities for sustained prosperity. Though the United States might be the so-called greatest of the strategically special relationship international prizes being sought by Riyadh, noteworthy is that the Crown Prince has made a point of recently visiting, first, Egypt and then the United Kingdom. Among the simplest of explanations for this sequence is that, next to the United States, no other Great Power nation has as long known Saudi Arabia and its needs, concerns, interests, and priorities as well as Great Britain. Neither should it be difficult to fathom why Egypt figures as highly as it does. With regards to the Crown Prince’s recent visit to Cairo, there is no denying that, within the Arab and Islamic contexts, where the Kingdom has chosen to lead and initiate more than follow and be reactive, he realizes he has no choice but to try to maneuver as effectively as possible amidst the fact that almost one out of every four Arabs is an Egyptian. Often left unspoken, however, is another Cairo-related factor. Egypt is the one Arab country more than any other that has attacked and in one way or another sought to inflict harm upon Saudi Arabia within the past two hundred years. It has done so twice. It is therefore for basically sound realpolitik reasons that anyone in Riyadh should want to do whatever is necessary and expedient to be on as good a set of terms with Egypt as possible. Indeed, Prince Muhammad bin Salman needs to ensure that there are no reasons for any further attempts from west of the Red Sea region to undermine the Kingdom’s security, stability, and prospects for peace and prosperity. Also of monumental strategic significance is Cairo and Riyadh’s bold intention to link their economic destinies geographically to an extent never before attempted in the two countries’ history. That is, Saudi Arabia’s Crown Prince envisions the establishment of a multibillion dollar entirely new city on the Kingdom’s Red Sea coast. The location, near Egypt’s popular tourist destination at Sharm El Shaikh on the Sinai Peninsula, is close to the Strait of Tiran that links Israeli and Jordanian access to the Indian Ocean and waters beyond. Less often spoken behind this initiative are Cairo’s and Riyadh’s geostrategic oneness, alongside the increasingly assertive geopolitical position and role of the UAE Emirate of Abu Dhabi and its Crown Prince, His Highness Shaikh Mohammed bin Zayed Al-Nahyan. The two have been keen to join their efforts to counter the advance of Iran and its geostrategic and geopolitical expansion from Tehran through Iraq, Syria, and Lebanon to the Mediterranean. HRH Prince Mohammed bin Salman confers with HH Shaikh Mohammed bin Zayed Al Nahyan, Crown Prince of Abu Dhabi and Deputy Supreme Commander of the UAE Armed Forces, on the sidelines of the May 2017 Arab Islamic American Summit in Riyadh, Saudi Arabia. Photo: Saudi Press Agency. Similarly, albeit in an entirely different geographical direction but for similar reasons of realpolitik, Riyadh’s reasons for aligning as much of its international financial considerations as possible and prudent with the United Arab Emirates are transparent. Doing so has a potential for tightening the alliance between the two fellow GCC, OPEC, Arab League, and Organization of Islamic Cooperation members. Without its western and eastern geopolitical partnerships within the Arab and Islamic worlds assured, or at least being cultivated to the hilt, Riyadh is well aware that it cannot hope to surmount challenges from Iran and elsewhere alone. Mohammed bin Salman has therefore been doing everything feasible to ensure that, at this still early juncture in his stewardship, his Saudi Arabian constituents have as little reason as possible to rise in opposition to him. His prospects for being able to register the requisite effectiveness in this realm of endeavor, however, cannot be assured by his acting alone. Rather, they turn in different ways on the extent to which internally he can indicate that he is doing everything possible to enhance the security, stability, and peace of his country internationally. Externally, they turn in significant measure on the degree to which he is effective in those among his international outreach efforts chronicled herein. As for the American piece of the equation, which is admittedly substantial, his effectiveness will turn to a significant degree on how well he does in two areas. One will have to do with the nature and extent of his undertakings unilaterally and jointly with powerful areas of the U.S. domestic economy, energy industry, and technology sectors. The other will be focused on what kinds of assurances he can secure from President Trump’s Washington. Regarding the latter, the goal will be to ascertain the extent to which the two countries’ respective national leaderships, interests, and key foreign policies are on as much of the same internationally strategic page and alignment as possible. As the engines of fiscal reform and economic transformation churn in Saudi Arabia, huge amounts of indigenous and international investment are needed if the Kingdom’s National Transformation Plan is expected to work. In the here and now, Crown Prince Mohammed bin Salman’s prospects are buoyed by the rise in the price of oil. The vicissitudes of the energy markets’ ups and downs notwithstanding, what is irrefutable is the Kingdom-wide acknowledgement of how vital continued injections of capital will be. In no other way do most analysts envision that the prospects for Saudi Arabia to be able to unlock additional economic opportunities for growth are realistic and attainable. a lighter, gentler face of public exhibitions and manner of enforcement of some of the stricter Islamic norms, principles, and values with a view to there being a much less stark contrast with the more moderate manifestations of the faith in other Islamic lands. The composition and expertise included in the high-level Saudi Arabian delegation scheduled to visit the nation’s capital, California, Massachusetts, Washington, Texas, and New York signal the Crown Prince’s seriousness not only in promoting investment in the Kingdom. They signal also an openness and a willingness to provide serious and favorable consideration to any mutually viable and beneficial arrangement that holds out the prospect of being reciprocally rewarding to prospective American-Saudi Arabian partners. With these kinds of ends in mind, the delegation is expected to address and examine the possibilities for further developing Saudi Arabian-U.S. relations in a wide variety of fields and levels. Simultaneously, also to be probed are just exactly what will be needed to further boost Saudi Arabia’s image in the United States in light of the Kingdom’s enormously ambitious transformation efforts. None who specialize in Saudi Arabia-U.S. relations will deny how difficult, challenging, and long-term an effort of this nature must inevitably and unavoidably be if it is to have any prospect of being effective. Of necessity, such a campaign will have to be addressed to the many Americans who have never bothered or cared to delve deeply into what was behind the tragedy that produced the terrorist attacks of September 11, 2001. It will also have to be introduced and championed among the many who do not want to be disabused of their longstanding negative viewpoints and prejudices against Arabs and Muslims, and against Saudi Arabians in particular. President Donald Trump with Custodian of the Two Holy Mosques King Salman Bin Abdulaziz Al-Saud at the Arab-Islamic-American Summit held in May 2017 in Riyadh, Saudi Arabia. Photo: Saudi Press Agency. Not least, such a strategy will have to be implemented among the many who simply do not care. These include those who deem it to be in their interest to maintain a negative stance towards the Kingdom. These view the country’s government and citizens as well as natural resources as objects – phenomena to be maligned, defamed, dehumanized, manipulated, exploited, disappointed, kept off balance, made to be on the defensive, and hemmed forever inside a perceptual box that wreaks of wrong and negativity. In addition, there are just as many if not more who simply are against having their preconceived notions of reality challenged, uprooted, or, for that matter, disturbed in any way. Making inroads with Americans who would protest, “Don’t provide me any new information or insight – my mind’s already made up” will not be easy. Not to be countenanced among such adversaries is that the Kingdom and its people should simultaneously be considered and appreciated for what they also are: namely, equal actors. As such, they have their own legitimate needs, their own legitimate rights, their own legitimate concerns, their own legitimate interests, and their own legitimate foreign relations goals. To give credit where credit is due, Prince Mohammed bin Salman is hardly arriving to Washington without any prior traction. He comes to America with the opportunity of building on his meetings with President Trump during the May 2017 Riyadh Summit. The United States and Saudi Arabia struck a series of deals totaling more than $350 billion spanning 10 years during that historic two-day meeting in the Kingdom’s capital last spring. Those agreements – including some that were prospective – involved a variety of industries, including information technology, medical equipment, chemicals, real estate, and $110 billion on defense alone. The agreements involved some of America’s leading firms, including Boeing, Lockheed Martin, Blackstone, Raytheon, General Dynamics, Exxon Mobil, General Electric, and Dow. The contracts and memoranda of understanding signed last year are to be further developed and implemented by the Saudi Arabian delegation and American representatives during this upcoming 2018 visit. Andrew Liveris, Chairman and CEO of the Dow Chemical Company, with H.E. Khalid Al Falih, Saudi Arabian Minister of Energy, Industry, and Mineral Resources, in May 2017 in Riyadh, Saudi Arabia. Dow signed two new cooperative agreements with Saudi Arabia during President Donald Trump’s visit to the Kingdom that month. Photo: Saudi Press Agency. In his first official trip to the United States in 2016, Prince Mohammed bin Salman’s initiatives for change in Saudi Arabia across many different sectors as well as within society itself, including the further empowerment of Saudi Arabian women, received much attention. 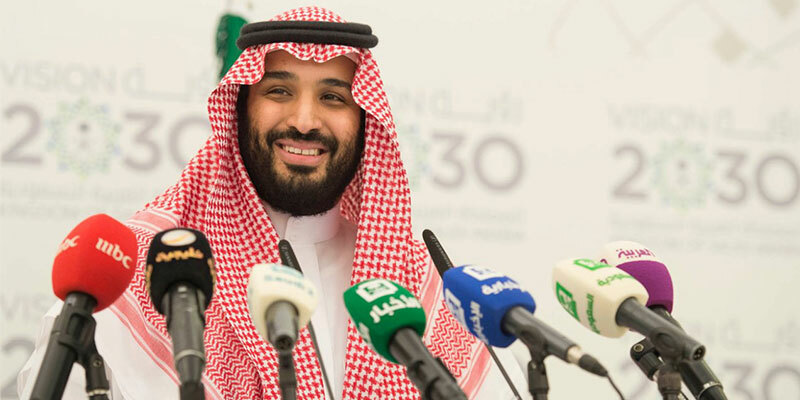 The Crown Prince is navigating modernity and tradition in a unique manner, and appears confident and intent to leave an impression that challenges Americans to think hard about the Kingdom’s future. Leaders are not leaders if they are unwilling to take risks as well as manifest a sincere willingness to serve. This leader has done both. He has broken with parts of tradition while respecting other parts that went before. In tackling corruption head-on and in taking giant steps to further equalize the status and role of women, he has done what would earn any leader kudos from his constituents and, especially, among those who might otherwise be disaffected. Moreover, in reaching out to such an extent to empower greater components of the Kingdom’s youth, he has shown the mettle of which he is made. What is more, he has done much to indicate the direction in which he intends to continue taking his country. Yet none of this has occurred or is occurring in a vacuum. It is transpiring all the while acknowledging that none are bereft of blemish. Indeed, what he will be able to accomplish will turn heavily on his innate and acquired gifts. These will have to be in evidence alongside the wisdom and shared experience of his advisors and those who govern with him. HRH Prince Mohammed bin Salman meets with Saudi Arabian students studying in the United States during a 2016 visit to Washington, D.C. Photo: Saudi Press Agency. Cognizant of the challenges but, to date, remaining steadfast in his drive for transforming the Kingdom, Crown Prince Mohammed bin Salman has positioned himself to push big changes in Saudi Arabia. In developing and promoting Saudi Arabia’s Vision 2030 plan and its implementation mechanisms, the Crown Prince is driving a youth-led reimagining of the Kingdom’s economy through pragmatic goals and approaches. The Vision 2030 plan is a bold step forward, seeking a collective effort towards dynamic economic and social governance, replacing what some charged as bureaucratic inertia. Perhaps most critical at this juncture in Saudi Arabia’s economic development efforts is the need to draw attention to the opportunities present in investing in the Kingdom’s future. New markets can be opened between the United States and Saudi Arabia in ways that further boost bilateral relations. The opportunity for women to drive in Saudi Arabia, which is little more than three months away, will have economic and social ramifications that herald a new era of possibilities for American investors. Already, American firms such as Ford, Uber, and Coca-Cola, together with Goldman Sachs and Citigroup, the latter returning after a thirteen year absence, have jumped in to capitalize on the changes taking place. In developing and promoting Saudi Arabia’s Vision 2030 plan and its implementation mechanisms, the Crown Prince is driving a youth-led reimagining of the Kingdom’s economy through pragmatic goals and approaches. A future where more American women can build strong, robust relationships with more Saudi Arabian female executives and ministers is imminent. This fact, in and of itself, is remarkable and a testimony to the dynamism in the Saudi Arabian-U.S. relationship. President Trump’s administration has embraced the goal of maintaining, strengthening, and expanding the U.S. relationship with Saudi Arabia. Drawing on their shared objectives of managing threats from Iran and working to counter violent extremism in the region, the partnership produced one of the more phenomenal moments in contemporary U.S.-Arab relations when President Trump visited Saudi Arabia last May. In Crown Prince Mohammed bin Salman’s upcoming visit to America, the relationship holds out the prospect of continuing to reap the dividends of the Saudi Arabian-U.S. long-standing cooperation. As Saudi Arabia’s leadership works to highlight the openness of the Kingdom’s markets, the opportunities in economic privatization with greater transparency than ever before, and the social diversity embodied in Saudi Arabia’s vision – together with the manifestation of a new, bold philosophy – there are sure to be naysayers. Some in the U.S. might not appear ready to accept a more liberal Saudi Arabia. To be sure, few specialists question whether the residue of the deeply ingrained negative images of the Kingdom’s leaders and its people, noted earlier, will likely continue for some time. No doubt, such images will be difficult to expunge from the consciousness of numerous Americans. So, too, will notions of the Kingdom as a hotbed of violent extremism be difficult to erase – or perhaps perceptibly, for many, even to subside. Changing the nature and range of impressions that have been pounded into the American consciousness for so long a period will be a daunting task. Yet it is not an impossible one provided that an appropriate strategy is adopted and, as importantly, sustained over time. It will be this mission, too, that the Saudi Arabian delegation will study and probe during its visit to the United States. Students from the National Council on U.S.-Arab Relations’ Youth Leadership Development/ Model Arab League Program visit the Al-Hijr Archaeological Site (Madain Saleh) in February 2018, the first Saudi Arabian property inscribed on UNESCO’s World Heritage List. Located at a meeting point on a trade route between the Arabian Peninsula, the Mediterranean, and Asia, the site represents cultural exchanges in architecture, language, and the caravan trade. Saudi Arabia is planning to issue its first official tourist visas beginning 1 April through the Saudi Commission for Tourism and National Heritage. The challenge of altering imagery, however, goes two ways. It is not just Saudi Arabia that has the task of overcoming a negative image in the United States. The United States, too, needs greatly to work on improving its image in the Kingdom, and elsewhere in the Arab and Islamic worlds. For just one example, President Trump’s government hardly conjured up an image of moral probity, responsibility, and respect for international law in its recent actions regarding Jerusalem, whose holy sites are sacred to the world’s 2.3 billion Christians, 1.8 billion Muslims, and 15 million Jews. As perceptions about Saudi Arabia and its partnership with the U.S. change over time, some of the keys to Saudi Arabia’s economic future may well presently lie in California, where many American technology companies have their headquarters. The Kingdom will be seeking investments and partnerships as it works to integrate artificial intelligence, robotics, and other information technology systems into its economic transformation, including the ambitious and forward-looking NEOM project. Meanwhile, in New York, businessmen and financial institutions will be discussing and probing a possible future listing of Saudi Aramco’s shares on the New York Stock Exchange (NYSE) as part of its planned record-breaking IPO. Although some of the public offering may be placed on the Tadawul (Saudi Arabian Stock Exchange) at first, there are also possibilities of future Saudi Aramco share offers on the NYSE. In Houston, energy and petrochemicals investments will likely drive the Saudi Arabian delegation’s focus as the Kingdom’s Saudi Arabian Basic Industries Corporation (SABIC) seeks to invest in Texas refineries in order to have America ship LNG to Saudi Arabia. Such an arrangement would help the Kingdom to realize the maximum benefit of its domestic oil production while not having to rely on producing LNG itself. Such a strategy, if it can be agreed to between the Kingdom and the U.S. Department of Energy, might assist in Saudi Arabia maximizing revenue for its ambitious transformation efforts. The Saudi Arabian delegation’s visit to Boston, a hub of high-quality education and technology, and other American cities holds out the prospect of enhancing the Kingdom’s efforts to further its intellectual capacity. There is no shortage of opportunities for new partnerships between U.S. and Saudi Arabian institutions to develop methodologies and approaches to management and analysis for knowledge transfer to young Saudi Arabian professionals and stakeholders. Crown Prince Mohammed bin Salman’s upcoming visit will therefore not only affirm the strength of the Saudi Arabia-U.S. relationship. It will also set the stage for new and enhanced bilateral ties. It is as true now as it was in the past that the Kingdom needs America and America needs the Kingdom. The mutually beneficial partnership, rooted in shared needs, concerns, interests, and objectives, has before it every opportunity to continue to grow. This is despite the inevitable challenges and periodic tensions and misunderstandings that are a reality of a relationship between any two strategically important states. Massive new opportunities are continually developing for U.S. companies to take part in Saudi Arabia’s national development plan. To this end, the Kingdom is working to find ways to make itself a more attractive investment destination for partners. One need only reference Saudi Arabia’s initiatives toward small and medium enterprises (SMEs) – by changing ownership rules and also by creating a SME Authority – to realize up close the ways in which the playing field inside the Kingdom is changing. The Saudi Arabian delegation visiting the United States will work to explain and promote how the Kingdom’s economic transformation is opening new doors for enhanced U.S.-Saudi Arabian ties. As time marches on, and as countries and societies evolve, so do the relationships between international partners. Put more precisely, international partnerships are but partnerships between human beings – in this case between Americans and Saudi Arabians. For the Saudi Arabian-U.S. relationship, a history of strong ties has laid roots for the flowering of new economic, social, cultural, and defense bonds. Transformation continues to be the operative word of the day not only for Saudi Arabia but also America’s relationship with the Kingdom and its young King to be.